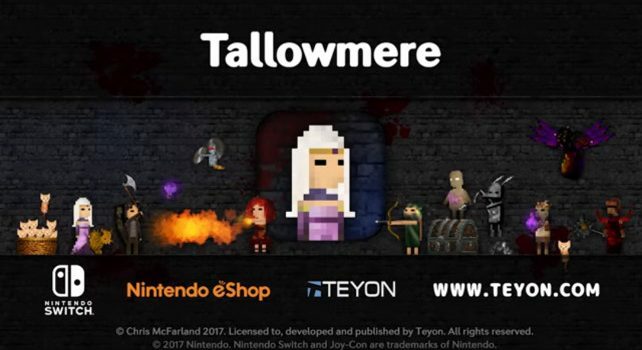 Teyon and Chris McFarland, the New Zealand developer and a license holder, haven announced the release of Tallowmere for the Nintendo Switch. The game is a 2D indie action roguelike-inspired platformer and will be the first Teyon title for the Nintendo Switch and it will be released on November 9th to the Nintendo eShop in Europe, Australia and Americas for $6.99. Japanese and New Zealand releases are scheduled to follow soon. Tallowmere was previously released in the past on Wii U and Steam by the original developer Chris McFarland. The game features randomly-generated dungeons which gets bigger, harder, and more rewarding the further you go. Raise your shield and hunt for the key in each room, or die trying. Be on your guard for every enemy, elite, boss, and treasure chest you’ll encounter. Discover new weapons and armor ranging from Basic to Otherworldly. The game supports 1-4 local players and has an infinite number of randomly-generated rooms. There are tiered loot including axes, clubs, katanas, daggers, ice wands, grenades, rocket launchers, and flamethrowers.